San Francisco’s paved surfaces such as buildings, streets, and parking lots cover most of the City, preventing rainwater from infiltrating into the ground. Instead of slowly filtering into soils, stormwater runoff now travels quickly over these paved areas, picking up pollutants like oil, bacteria, and debris before it flows to the city’s combined or separate sewer systems. Streets cover approximately 25% of the city’s surface, contributing significantly to these stormwater flows. The underground sewer system is an integral part of the city – carrying sewage and stormwater away from landscapes, businesses, and homes. There are two types of sewer systems in San Francisco: our combined sewer system and our separate sewer system. Most of San Francisco is served by a combined sewer system which conveys wastewater and stormwater in the same set of sewer pipes. Typically, this combined effluent is sent to a treatment plant where it is treated to secondary treatment standards before being discharged into the Bay or Ocean. However, during heavy rain storms, the large influx of water can exceed the capacity of the city’s treatment plants. During these events, our sewer system treats the combined effluent to the equivalent of primary treatment standards before discharging it to the bay or ocean. This is called a combined sewer discharge. During heavy rainfall, the sudden influx of stormwater can also lead to flooding in low lying areas of the city such as historic creek beds. In combined sewer areas, one of the city’s goals is to decrease the quantity of runoff traveling to our combined sewer system. 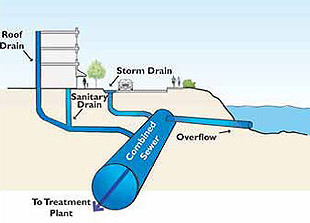 Some areas of San Francisco have separate storm sewer systems. In these areas, stormwater and sewage travel in separate sets of pipes. In San Francisco, about 10% of the city is served by separate storm sewer systems, including Mission Bay, Hunter’s Point, the Presidio, and Lake Merced. 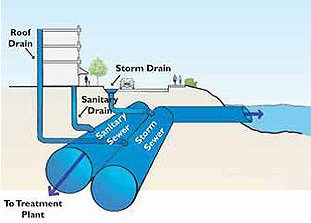 In areas served by separate storm sewer systems, street runoff generally flows untreated directly to the bay or ocean. In separate sewer areas, one of the city’s goals is to improve the quality of stormwater runoff before it reaches the bay or ocean. The City of San Francisco is developing multiple solutions to better manage stormwater in both the city’s combined and separate sewer areas. Solutions include upgrades to our grey infrastructure (pipes and treatment plants), as well as low impact design-based solutions, also known as green infrastructure. Low impact design-based solutions are appropriate for integration into many streetscape projects, as they can provide additional benefits to the street, including greening and traffic calming. Low Impact Design (LID) is a stormwater management approach that mimics the natural hydrologic processes of the landscape by increasing retention, detention, and filtration of stormwater runoff at its source. LID methods use small decentralized stormwater treatment facilities to treat runoff before it reaches the sewer pipes. Detention: Collection and holding (or slowing) of runoff in temporary storage or vegetated systems before it is slowly released. Retention: Capturing stormwater on site and keeping it there – either through infiltration, rainwater harvesting, or evapo-transpiration from plants and soils – leading to an overall reduction in stormwater runoff to sewers. Infiltration: Penetration of water into the soil from the ground surface. Designers typically select from a toolkit of LID techniques that will best manage stormwater at a particular location. Whereas some LID tools are appropriate for homeowners and small property owners to install in front of their property, others are more complex to design and are better implemented as part of a larger block-scale or neighborhood-scale project. LID is scalable to small sites and construction budgets. Unlike traditional wastewater treatment systems that necessitate large public investments, complex infrastructure, and centralized treatment facilities, LID represents a low-cost, distributed approach to stormwater management. The permitting process for stormwater LID features varies depending on the particular tools selected. Typically, LID would require one or more permits from DPW, with potential review by other City departments. If you choose or are required to install stormwater LID features, you are responsible to obtain the relevant permits for the particular design feature and meet all applicable guidelines. See individual LID tools pages for specific process and permit information. San Francisco encourages (and sometimes requires) stormwater management on individual parcels. In addition to the stormwater management tools described on this site, there are other LID techniques, such as rainwater harvesting and green roofs, which homeowners, businesses, and developers can implement on individuals parcels. New and redevelopment projects that disturb 5,000 square feet or more of ground surface, measured cumulatively for a site, are required to manage the stormwater that falls on their site. While these requirements can be met by managing the stormwater within the parcel, these requirements may also be partially or entirely met by providing stormwater treatment facilities in the right-of-way. See individual LID tools for more specific guidelines on LID tools appropriate for the streetscape. * Site conditions such as street grading may require special engineering; comply with DPW Director’s Order on Permeable Paving. Sidewalk zones: Generally, all except travel lanes on collectors or arterials, bus stop concrete pads. ** Best used in locations with few driveways or curb cuts. Before implementing LID techniques, it is important to assess a site’s existing conditions and choose stormwater treatment controls that will be successful in that location. Streetscape geometry, existing utilities, topography, soil conditions and climate determine the types of LID tools that can be implemented. The initial step in selecting a stormwater tool is determining the available open space and existing site constraints. After identifying the appropriate stormwater facilities for a site, an integrated approach using several LID tools is encouraged. To increase the stormwater management benefits, multiple LID tools can be used in succession—called a treatment train approach. LID tools should be designed using available topography to take advantage of gravity for conveyance. Concentrating too much runoff in one area should be avoided. Except in cases of very simple LID techniques, such as sidewalk landscaping, a complete geotechnical report considering infiltration rates, soil toxicity and stability, and other factors should be undertaken to determine whether or not it is acceptable to have stormwater infiltrate into underlying soils. Stormwater management benefits may be limited to runoff detention and filtration if lining is necessary to prevent stormwater from percolating into the soil below. Stormwater management tools can still be incorporated into areas of low permeability or where infiltration of stormwater is not desirable if special measures are undertaken. Underdrains should be used in areas where ponding is a concern. The location of the underdrain is an important consideration: if placed higher in a facility, the stored water below the perforated pipe will be infiltrated; if placed at the bottom of a sealed system, the perforated pipe will release the stored water slowly over time. All stormwater management strategies must have an approved overflow location for discharge. Minor details can translate into the ultimate success or potential failure of a system. For example, poor soils may cause ponding conditions in which some plants will not survive. Over-compaction or smearing (sealing) of subsurface soil during construction can lead to reduced infiltration capacity and cause ponding. The bottom surface of infiltration areas should be level and properly prepared to allow even stormwater distribution across the site and consistent soil permeability. Landscaping should be chosen to fit the specific type of stormwater facility and should be appropriate for the local climate and soils. In general, all landscape-based stormwater facilities should be densely planted with drought-resistant and water-tolerant plantings that can survive periodic drought and inundation. Native, deep-rooted plants or Mediterranean plants have been proven most effective in San Francisco. Sub-surface utility locations and building laterals should be considered in the design and placement of LID tools – access to utilities should be maintained. The presence of multiple driveways may also limit the ability to provide stormwater facilities. Where a high number of driveways or utilities reduce the ability to implement stormwater management tools on sidewalks, median locations for stormwater facilities should be considered. Stormwater facilities that incorporate open planters, channels, or ditches should not be located in the through path of travel, at corners, or anywhere along the required accessible path. Where stormwater facilities cross the path of travel, they should be covered by an Americans with Disabilities Act (ADA)-compliant cover. Permeable paving systems in the path of travel should have no more than 1/4 inch gap between pavers. Where there is a vertical drop between sidewalks and stormwater facilities (such as rain gardens or channels), a 4 inch high lip should be provided at the edge of the facility for tactile detection. Appropriate strategies near transit stops include: building-adjacent planters, covered channels or runnels, and permeable paving. Any drainage feature within a transit waiting area should be covered by an ADA-compliant cover. Certain stormwater facilities, such as those that use open planters or channels, are generally not appropriate within transit stops. Maintenance responsibilities for LID features vary depending on a number of factors. In the case of sidewalk landscaping, it is the property owner’s responsibility to maintain the improvement. If stormwater treatment controls are installed in the right of way to meet the City’s Stormwater Design Guidelines, it is the developer or owner of the development who is responsible for maintaining the improvement. Maintenance responsibility for other LID features varies. It is important to meet with the permitting agency early on in the process to develop a long-term maintenance strategy for your project. This will help expedite the permitting process and ensure long term functionality and success of your LID improvement.